Weekly Lincoln Woods Mountain Bike Ride! We are a full service bike shop in Cumberland, RI carrying Rocky Mountain, IBIS, SALSA, Transition, Redline, Banshee, Surly and KHS. 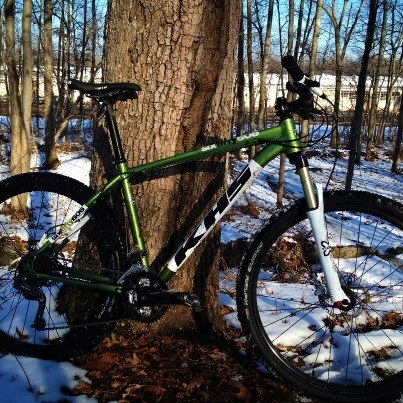 We offer quick and reliable service work and host a weekly NEMBA mountain bike ride at Lincoln Woods. Our address is 391 Mendon Road Cumberland, RI 02864. Phone is 401 335 3163. Winter hours are now in effect: Monday through Friday 12-6, Sat 10-6. News! Winter Vacation dates, demo bikes and other junk. Hi there. Hopefully you've survived the Mayan Apocalypse, the New Year and gotten out and enjoyed the snowfall in one way or another! Also, you have hopefully avoided riding a trainer! That in and of itself may be a fate worse than any centuries old prophecy of doom, and as such is to be avoided at all costs! Go skiing, snowboarding, snowshoeing or just drink beer and catch up on episodes of The Walking Dead. Whatever, anything is better than pedaling and going nowhere. Don't be a trainer Zombie! On the topic of survival we've made it through another season and we will be taking some vacation time during the month of February. We'll be closed beginning on February 3rd, and we'll be back on February 18th. 15 days is a long time to be shut down but it is winter in New England, and if not now then likely never. On the new bike front we're already pretty well loaded up with hardtail 29ers (Flare to the Vertex 930) and commuters (Metropolis LHR) from Rocky Mountain. We've also managed to get some saddle time in on our demo 650b hardtail from KHS and we should also see a few of the Rocky Mountain 650b Altitudes in here before March. One of the Altitude 750s will be available as a demo as well. The KHS hardtail will be available to demo for $20 and will be a great way to check out the wheel size in a general sense. The Rocky will be available for the normal demo rate of $50. Same deal for the Banshee Prime, the Banshee Rune, the Transition Trans AM, the Surly Karate Monkey, the Rocky Mountain Vertex 970RSL and the Ibis Mojo HD. Do you think we have a enough demos?! Oh, and we're also now a Pivot dealer! This is pretty awesome news for us and we're really excited to see John's new LES frame when it arrives next week. He'll be out there ripping people's legs off on a regular basis and we couldn't be more stoked that he's going to be doing it on a Pivot. In case you were wondering, we do still have a few demos up for sale from last season. Transition Trans AM 29, Large. We dropped the chainguide and went with an MRP 1X Guide to shed some weight, and we upgraded the wheelset to a set of Stan's Flows! Otherwise the build is the same as it has always been. $1900 takes it home! We also still have the large Rocky Mountain Vertex 970 RSL on sale for $2,400. So, that about wraps it up! If you're feeling like it please swing by our Facebook page and throw us a "like". We're trying to hit the 500 mark this season for some reason or another. Your efforts in this regard are appreciated! Endura Clothing. Remember folks; "If it's not Scottish it's crap"! Fox Suspension, for when you get your priorities straight. NEMBA - Your NE Trail Advocacy Group! RI NEMBA, your local dirtbags. RaceFace - More Canadian stuff?! Sho 'Nuff! Surly Bikes. Nice steel bikes from nice people. The New England Mountain Bike Association, join already!